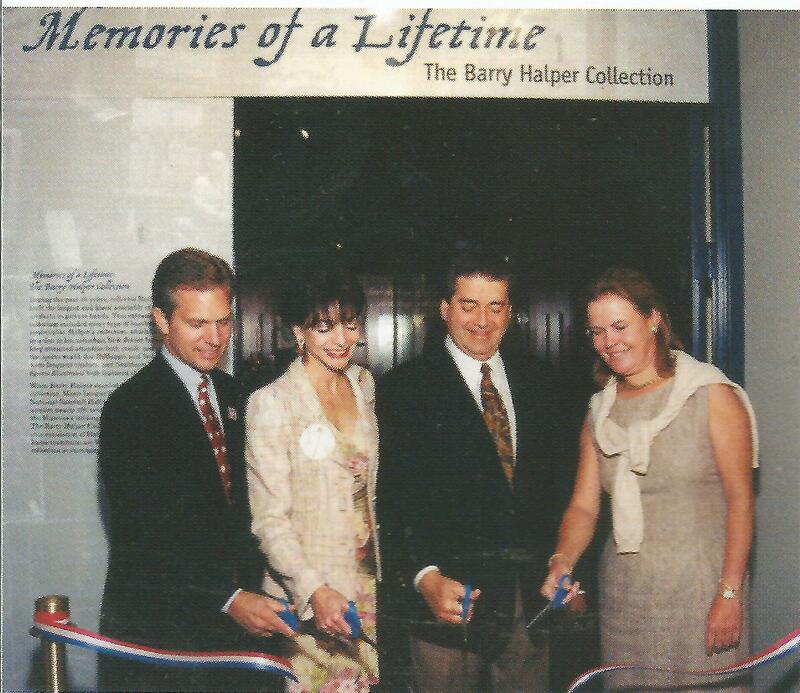 Halper cuts the ribbon to the HOFs now defunct Halper Gallery just before he sold artifacts stolen from the NYPL and HOF at Sotheby's in 1999. After offering an 1879 baseball contract stolen from NYPLs famous Spalding Collection earlier this year, Heritage Auction Galleries, of Dallas, Texas, was selling yet another stolen item from the library’s flagship Fifth Avenue branch, which was part of the 1970s heist said to be orchestrated by the deceased super-collector and New York Yankees general partner, Barry Halper. But last Friday, after being notified by Haulsofshame.com that the item was stolen, Heritage removed the artifact from its sale scheduled for this week. 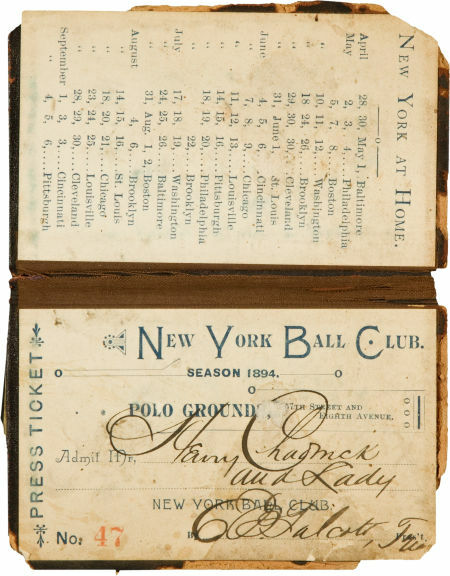 The rare item was a complimentary season pass issued by the New York Giants in 1894 to Baseball Hall of Famer and pioneering baseball scribe, Henry Chadwick. Heritage estimated that the pass would have sold for close to $2,000. The 19th-century season pass that appeared in the sale online and in a catalog as lot 81345 was originally pasted into one of Chadwick’s personal scrapbooks that were gifted to Albert G. Spalding and subsequently donated to the NYPL by the magnate’s widow in 1921. The library still retains the entire Chadwick scrapbook, however, the pass was cut from a scrapbook page when it was stolen sometime before 1983 when SABR and historian John Thorn organized and funded the microfilming of the manuscript and scrapbook holdings of the Spalding Collection. 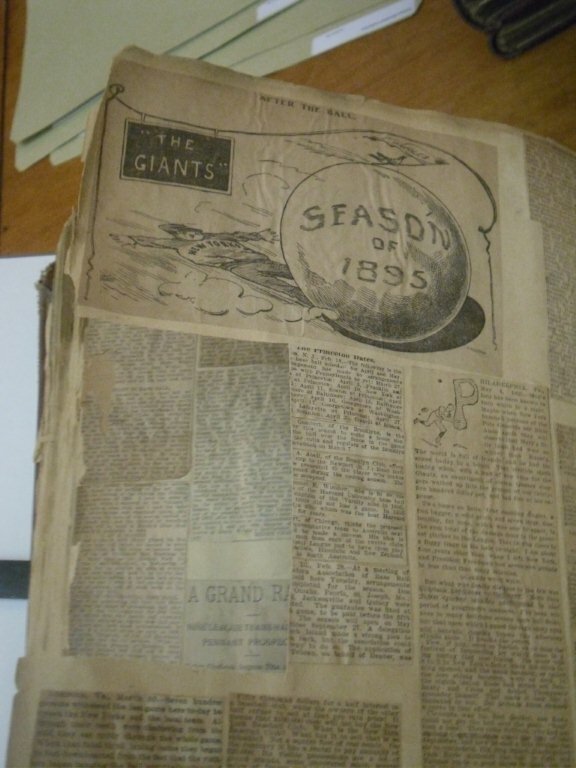 This group of three items is comprised of: a blue 1894 “Yale University Nine” season pass in the name of Henry Chadwick; a fold-over 1894 New York Giants season press pass for Henry Chadwick, which includes the team’s home schedule; and Chadwick’s Base Ball Manual from 1889, complete with with a beautiful color cover of a game in progress. Both passes have scrapbook residue and paper loss on their reverse, but are in good condition overall; the manual is in very good condition. This 1894 NY Giant pass issued to Henry Chadwick was stolen from the NYPL's Spalding Collection and was also being offered for sale by Heritage Auction Galleries. Heritage did not denote any evidence of scrapbook removal in its lot description of the pass issued to the “Father of Baseball” and signed by NY Giant executive Edward Talcott in 1894 when the Giants won the Temple Cup. Chadwick’s scrapbook, designated “Scrapbook No. 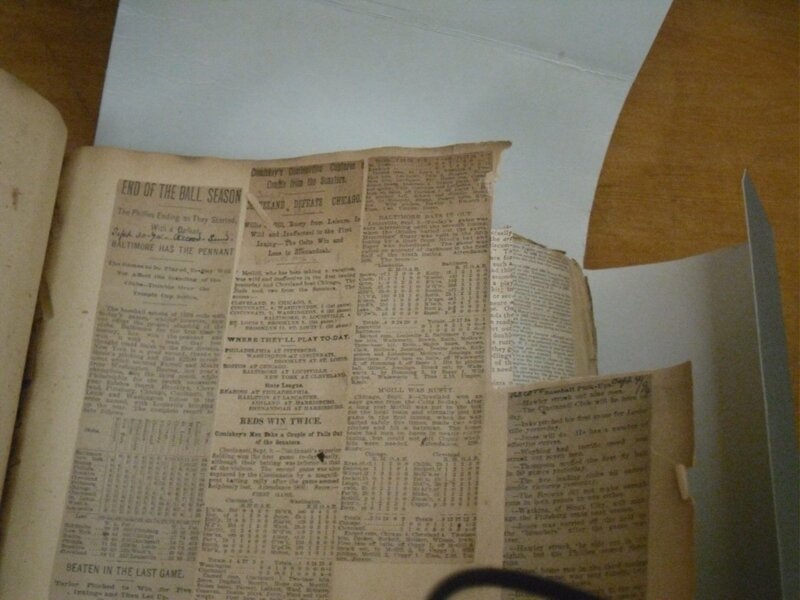 3 1891-1900,” is now housed in the library’s Manuscript Division and shows evidence of vandalism and the theft of the pass which was cut from its scrapbook page with a sharp object. It is likely the other pass issued by Yale, also sold by Halper in 1999, was located on another scrapbook page that also shows signs of vandalism and theft. If both passes were matched to the exact pages illustrated by Haulsofshame.com, they would fit perfectly on the pages they were wrongfully removed from. Heritage had access to Haulsofshame.com’s “Halper Hot 100” list published in 2010. The 1894 pass issued to Chadwick appears on that list as stolen item number 72. When we notified Heritage’s Director of Sports Auctions, Chris Ivy, that he was selling another stolen item, he asked us for a contact at the NYPL he could discuss the item with. We referred him to the FBI and Ivy declined to answer any of our other questions. Ivy also declined to say whether his consignor Seth Swirsky had returned the stolen 1879 Sutton contract to the FBI or NYPL. 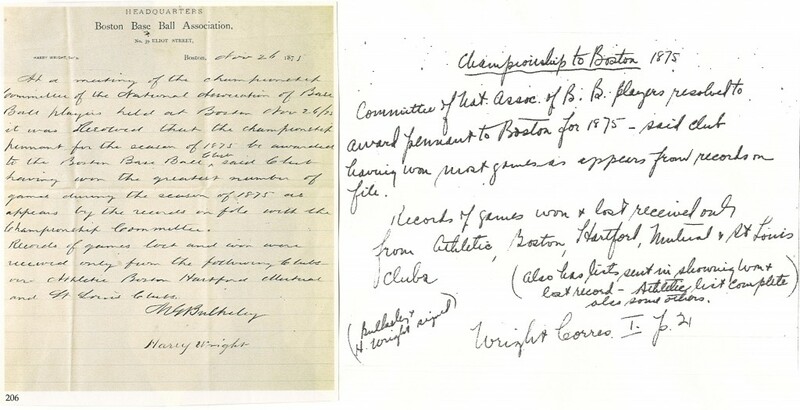 The current FBI probe into the thefts commenced officially in July of 2009 when documents stolen from the library’s Harry Wright Correspondence scrapbooks appeared in the MLB/Hunt auction at the 2009 All Star Game. Over fifty stolen documents were offered in that sale, but currently three entire volumes of approximately 1,500 to 2,000 documents are still missing. Historian and author Dorothy Seymour Mills helped confirm many of the letters were, indeed, stolen, as she had documented the actual letters in the Hunt and Halper auctions in her footnotes and original research notes from the 1950s. Seymour-Mills co-authored Baseball: The Early Years with her late husband Dr. Harold Seymour and held many of these documents in her own hands while researching at NYPL in the 1950s. Special Agent Jim Margolin from the New York City FBI press office said he would check for further details on the stolen relic, but was unable to respond before this article was published. Barry Halper sold several other stolen documents from the same missing scrapbooks in the 1999 Sotheby’s auction of his collection. Halper first claimed he owned Wright’s correspondence as early as 1977 in The Sporting News. His 1999 sale featured stolen documents written by Harry Wright, A. G. Mills, A. J. Reach, Jim Devlin and other 19th century baseball figures. He also sold an 1859 Challenge Letter that was stolen from NYPL’s Knickerbocker Correspondence Collection as well as stolen photographs of Wright, Chadwick and others. After his death in 2005, Halper’s widow sold several other items stolen from the Spalding Collection including a CDV and a cabinet photo of 19th century sporting goods king Andrew Peck and others including Harry Wright and one that fit the description of a missing NYPL photo of Alexander Cartwright Jr. Those items were sold in 2007 by Robert Edward Auctions, the company headed by long-time Halper associate, Rob Lifson, who was also Halper’s hand picked consultant in charge of his sale at Sotheby’s in 1999. Lifson oversaw the entire auction including the lot descriptions of all items in the sale including the contraband artifacts. Sources indicate that when they hired Lifson, Sotheby’s was unaware of the auctioneer’s personal history related to the Spalding Collection as he was apprehended for attempting to steal artifacts from the Fifth Avenue branch of the NYPL in 1979 when he was a student at the Wharton Business School at the University of Pennsylvania. At the time, Lifson was Halper’s major supplier of 19th century artifacts and a self proclaimed “card scholar” who was one of the leading dealers of baseball artifacts in the country. Lifson has made several conflicting confessions of his apprehension at the library stating that he tried to steal one rare CDV photo in one account and two rare photos in another. When Time Magazine covered the theft in 1979 they indicated that library security stated the man apprehended attempted to steal several cards in a “cache of smiling infielders” and had $5,500 in cash on his person at the time of the incident. Lifson recently said he was under the influence of drugs and alcohol when he was apprehended, however, Time reported in 1979 that the thief had secreted the rare cards from the collection by affixing a bubble gum box to his brief case to smuggle the cards out of the library. 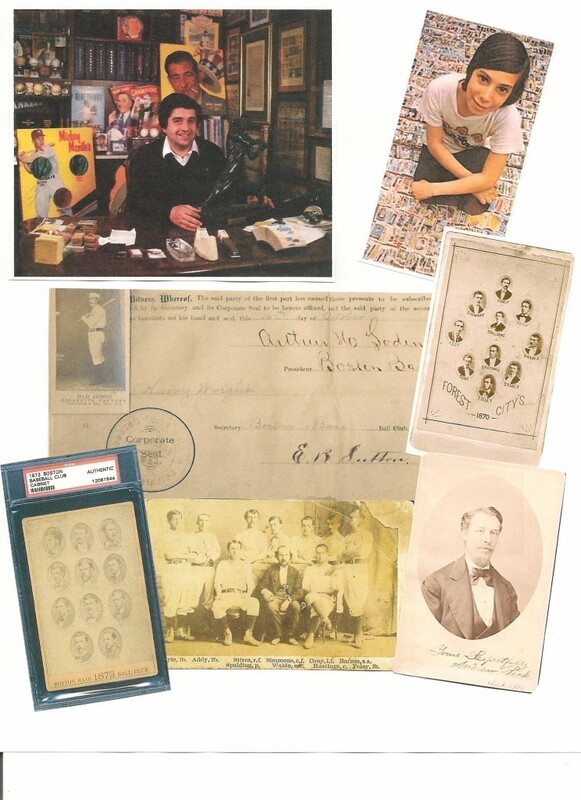 An assortment of stolen and missing items from the NYPL’s Spalding Collection: (Clockwise from top left) Barry Halper c. 1984 with stolen 1879 Sutton contract hanging on his wall, Rob Lifson as he appeared in a National Geographic publication, “Kids Did It”, 1870 Forest City Base Ball Club CDV, Andrew Peck cabinet card, 1869 Forest City Base Ball Club CDV, 1873 Boston Red Stockings CDV, (Center) 1879 contract of Ezra Sutton. Lifson oversaw and organized the 1999 Halper sale along with Marsha Malinowski, Sotheby’s head representative in its Books and Manuscripts division. Calls to Sotheby’s for comment to Malinowski about the auction house’s sale of the stolen items were redirected to the Sotheby’s press office as Malinowski is no longer with the company. We asked Sotheby’s spokesperson Emily Bergland if they had been approached by customers requesting refunds for stolen materials sold in the Halper auction and what the company’s position is in regard to its customer’s rights after purchasing contraband items. Bergland said she would inquire within the company but has not yet provided any information that could aid collectors currently in possession of NYPL property. 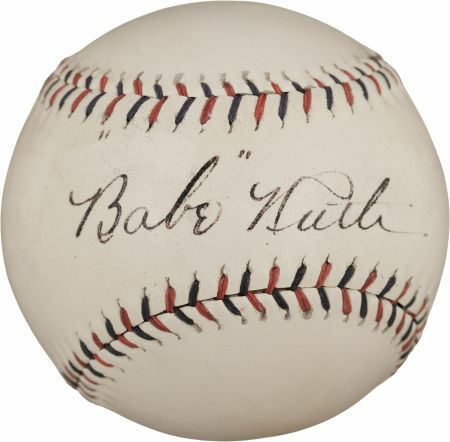 Stay tuned for our next report, another installment from our Operation Bambino series, focusing on another lot in Heritage’s current auction, a controversial alleged single-signed Babe Ruth ball with a current bid of $110,000. Always fantastic information however when will the hobby be able to learn who the consignors are of these stolen items. Let’s not forget, a few years later of thefts from the Baseball Hall of Fame, a dealer was dumb enough to place items in his own auction, therefore being exposed. One guess who he works for now! What a shame that an industry that I so adore is apparently so filled with thieves, liars, and snake oil salesmen. And it’s a shame that so many innocent people get caught up in their antics. Bravo for your excellent, determined research. It doesnt surprise me at all, that Halpers name is being involved in any of the thefts, no matter what they were or where they were done.He was the biggest crook on this earth and it is to damn bad that he isnt around to get nailed and put away in a 6×8,instead of a 2×6 under the ground. Great article Peter!!!! I feel there is finally someone to help keep our hobby safe and to help other from being taken by shady dealers. ONCE AGAIN WE ALL OWE THANKS TO YOU FOR CONTINUING TO BRING THESE THEFTS AND LOSSES TO LIGHT … THE MORE THAT IS KNOWN AND PUBLISHED THE BETTER AS THIS SHOULD FLUSH OUT EVEN MORE ITEMS WHICH NOW SHOULD NOT BE ABLE TO BE SUCCESSFULLY SOLD AGAIN, VERY MUCH AS THE ARTWORK INDUSTRY DOES WITH ALL OF THEIR VARIOUS THEFTS AND LOSSES … YOU ARE TO BE COMMENDED MOST HIGHLY FOR YOUR ONGOING EFFORTS IN THIS RESPECT … WHO WOULD EVER HAVE THOUGHT SO MANY DIFFERENT ITEMS WOULD BE TAKEN FROM THESE VARIOUS SOURCES TO BE SOLD, TRADED OR GIVEN TO OTHERS OVER TIME. Peter your article proves that there are some very determined men out there desperate to get their hands on the prize. The clues they leave behind are proof of this. Another excellent article, you’re really doing something great with this website. I suppose when you already have everything it’s possible for you to legitimately get your hands on it’s very tempting to steal what’s, as I think Halper put it, “there for the taking” in public institutions. I’m glad another stolen artifact is being returned. I’m also a massive soccer fan, and I was disheartened to see a fairly accurate, but far from perfect, reproduction of an extremely rare jersey, mis-represented as match-worn when in fact it was a replica only 5-10 years old, from the 1980s sell for almost $1500 on eBay this week. The differences were subtle but nonetheless definitely discernible from the real article. I reported the listing twice, but eBay doesn’t seem very interested in dealing with fake merchandise (without counterfeit merchandise, there wouldn’t be much on eBay). Once you move into the territory of player-used artifacts in sports you should research until you can prove to yourself that the article is genuine, fraud is absolutely rife in the sports memorabilia industry. This article provided many tips. Very useful to me. Thanks a lot ? Yet another 65+-year-old autographed ball (the Ruth above) in lilly-white, like-new condition. Where are people getting the balls from to make these fakes? Are they old balls cleaned up, or are they newly-made? Could a shoemaker experienced in leather work polish up an old ball, or make a replica ball from scratch?